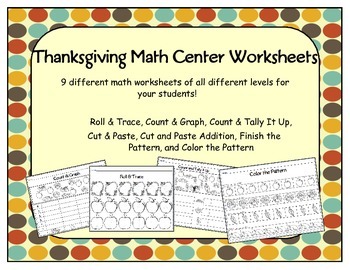 Fun Thanksgiving Worksheets! 9 different math worksheets of all different levels for your students! 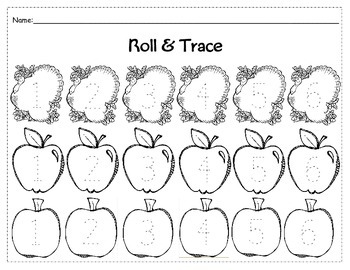 Roll & Trace– Have your students roll a dice and trace the number they rolled. Count and Graph– Your students will count the Thanksgiving pictures they see and color in the bar graph. Count & Tally It Up– Count the Thanksgiving pictures and keep tally of the pictures. 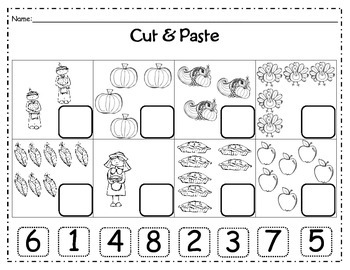 Cut & Paste– Your students will count the Thanksgiving objects, cut the number out, and glue it on the correct spot. Cut, Match, and Glue– There are 2 pages for this worksheet. Your students will cut out the squares with the numbers and glue it on top of the Thanksgiving pictures. Finish the pattern– Your students will finish the pattern by cutting out the pictures and gluing them in the appropriate spot. 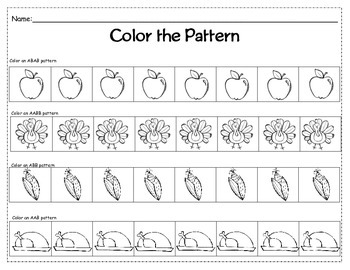 Color the Pattern– There are 2 worksheets that you can use. One worksheet has the patterns written out already and the 2nd worksheet is blank so you can write out your own patterns for your students.